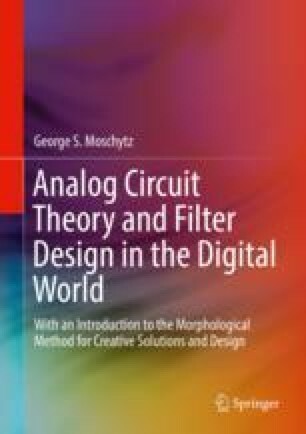 A plethora of single-amplifier second-order active filter circuits that can be cascaded into filters of higher order have been published in the literature and have been put into practice. These circuits are filter building blocks whose numerator and denominator are of second order, i.e., biquadratic; they are therefore referred to as “biquads” (see Chap. 7). Actually, the numerator of a biquad can be equal to or lower than second order. Furthermore, for odd-order filters, the extra pole needed to make a third-order cascadable building block can readily be obtained by adding a single resistor and capacitor to the input of the circuit – which is still referred to as a “biquad.” In this case the degree of the numerator can then also be up to three.